But with the same number of hours in the day, how do you give people what they want? Let’s be clear. Nobody’s advocating putting your social media content on complete autopilot (after all, it is social, which means you have to show up some time). But with a lot of content to sift through and a lot of sites to publish to, using time-saving tools can help make your life easier while building a strong, content-led social media presence. 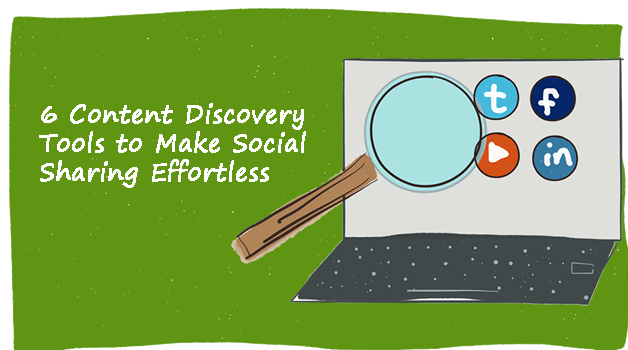 These 6 content discovery tools can help with that. 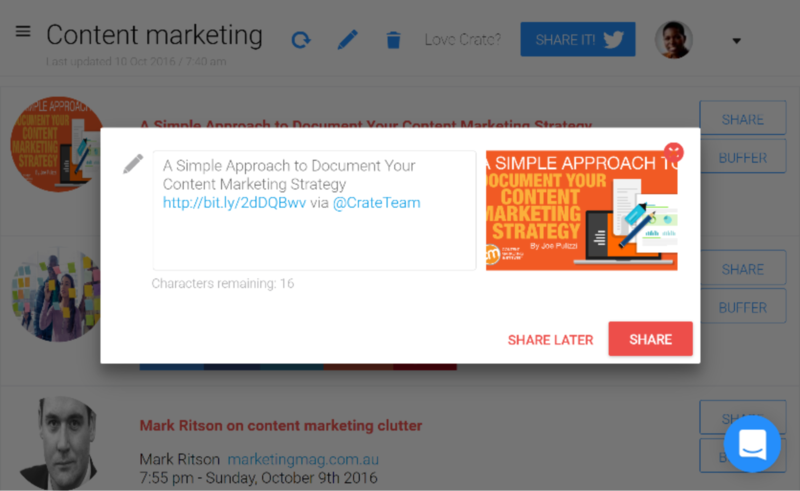 Crate automates content discovery, but it requires your input for social sharing. To use Crate, login with Twitter then click on “build a new Crate” in the menu. A “crate” is a search that you build. Use the on-screen options to name your crate (I have one for “content marketing,” for example) and to fine-tune the search parameters. You can include or exclude websites, keywords, and particular Twitter usernames. Press “save” and wait for the crate to populate with content. It will continue to update automatically, so every time you log in to the site there will be new content to share. Each piece of content displays current sharing stats for a range of social sites, so you can easily tell if a particular piece of content is already popular. 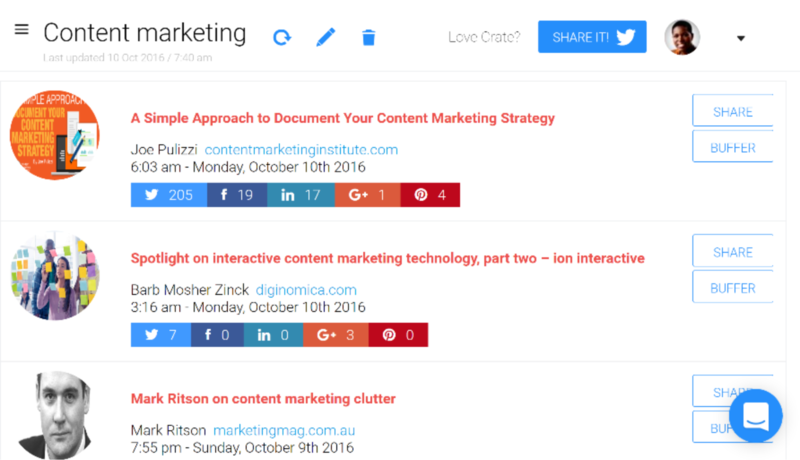 Crate uses engagement and sharing metrics to decide which content to show you. 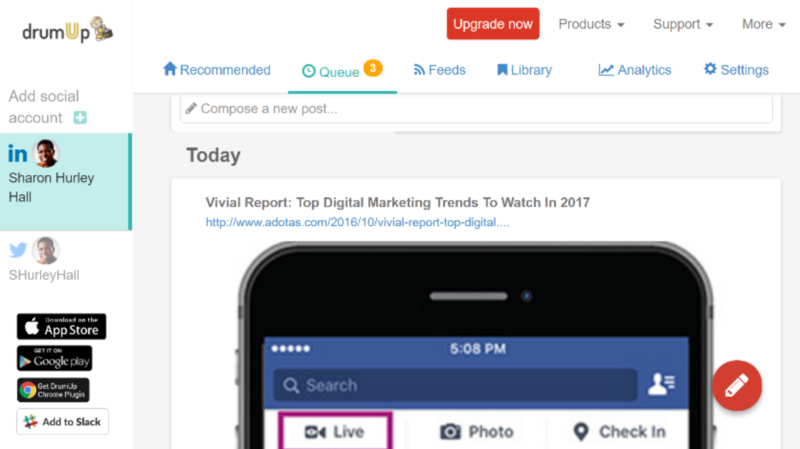 Each piece of content displays current sharing stats for a range of social sites, so you can easily tell if a particular piece of content is already popular. 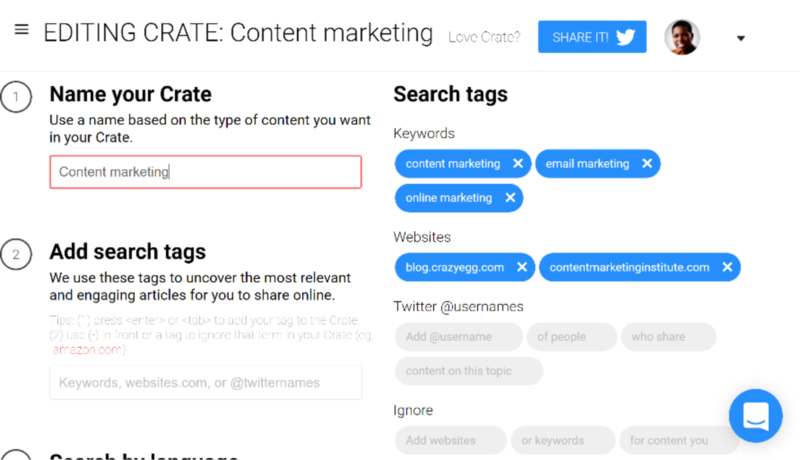 Crate uses engagement and sharing metrics to decide which content to show you. Press the share button on the right to share your content to Twitter. By default, the tweet mentions Crate but you can easily change that. At this point, you can press either the “share” or “share later” buttons. 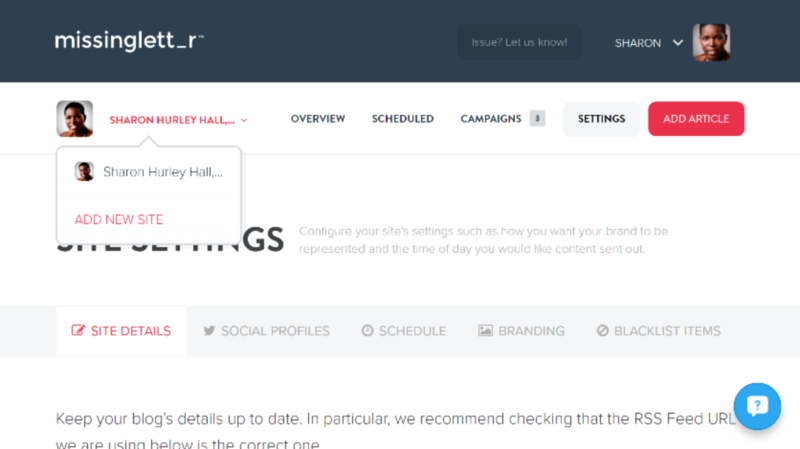 Share later lets you choose the date and time for publishing the content. If you upgrade to a paid account, you can use Crate with Buffer, streamlining the process even further so you can add relevant content directly to your Buffer queue. If you don’t, you can still use Crate for discovery; you’ll just have to spend a little more time on the sharing part. I have also used Crate for my own site content. I created a “my website” crate, then added only my website’s URL into the search box. Crate automatically discovers my latest posts and I can use it as another way to share the content. This could be useful if you’re not already using a tool like Buffer or Hootsuite. Finally, consider creating a single crate with the top websites you follow. 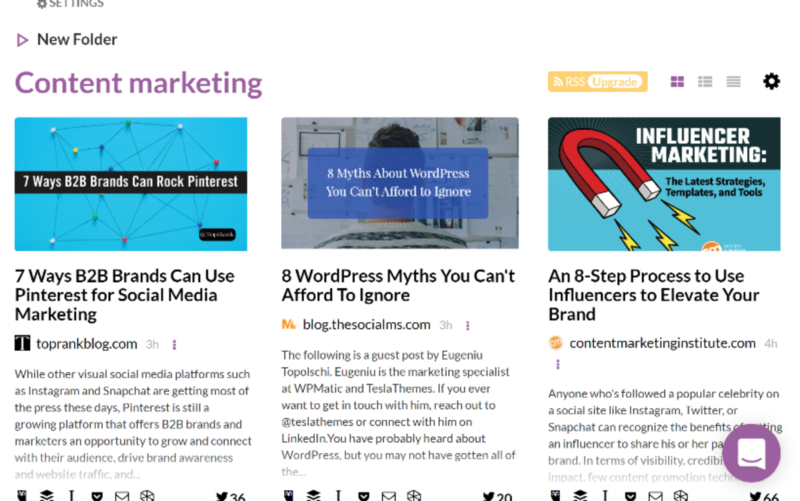 This is a best-practice tip from Crate which lets you have a single feed with all the best content from trusted sources. 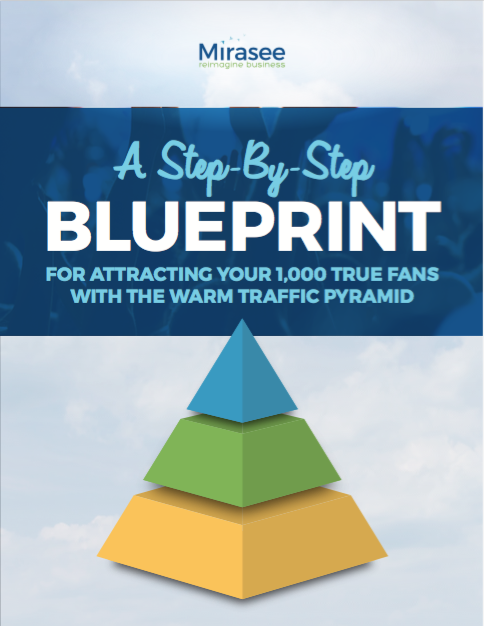 BONUS: Click Here To Get A Step-by-Step Blueprint for Attracting 1,000 True Fans! 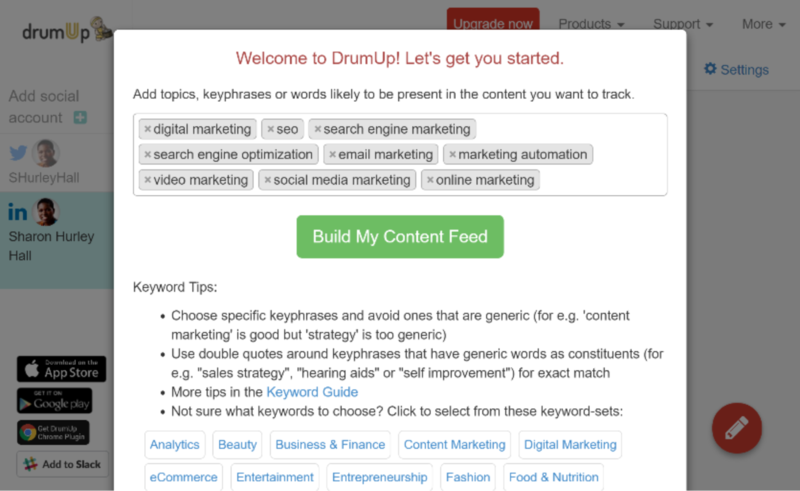 DrumUp is another useful content delivery and sharing tool. To get started, log in with Twitter, Facebook, or LinkedIn. Enable the account, then build your content feed by adding keywords and keyword phrases that represent the type of content you want to curate. DrumUp warns against using terms that are too generic. 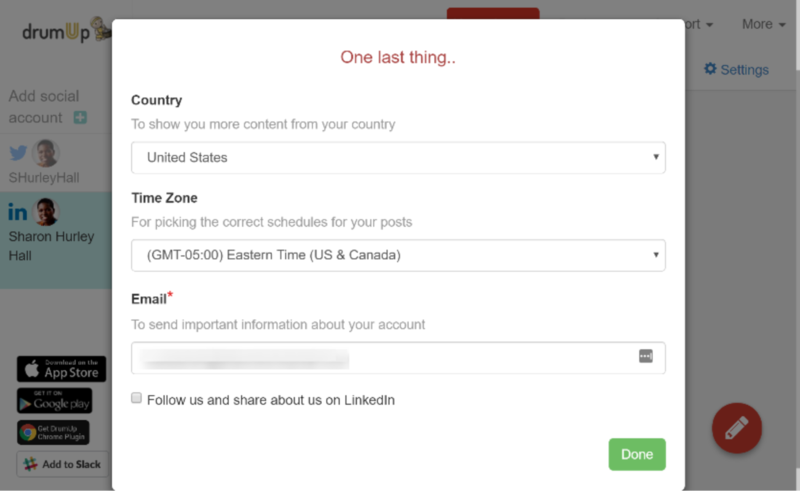 Click on “build my content feed,” then add information about your country, timezone, and email. 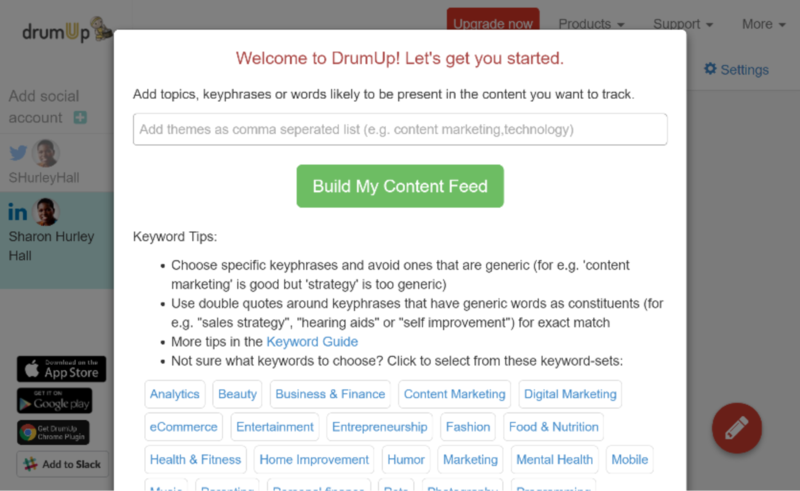 DrumUp will find content and present it for you to approve. If you’re not totally happy, visit settings to refine your content requirements by using negative keywords to eliminate irrelevant content from your feed. 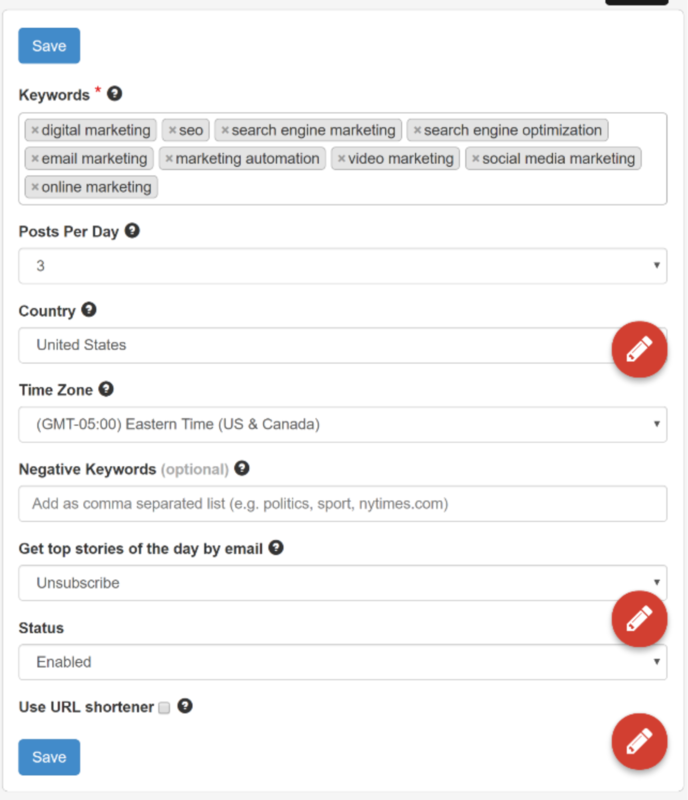 You can also choose post frequency (maximum 3 per day) and decide on whether you want an email digest (a useful service if you often share interesting content by email). 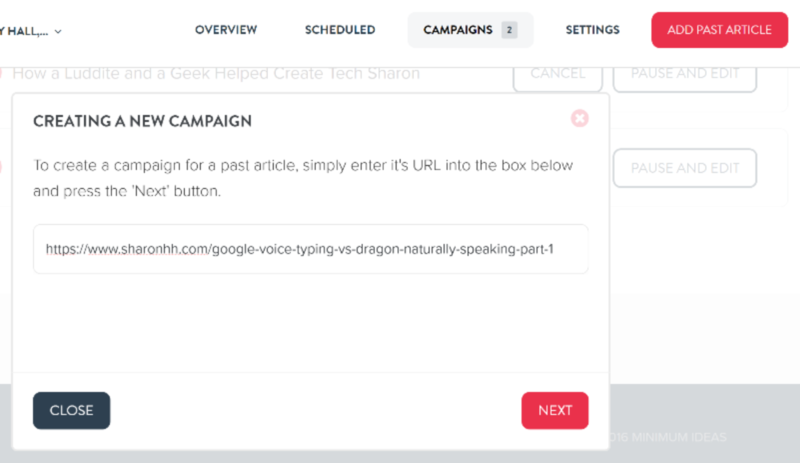 Read through your content queue and schedule content with one click at a time. With a paid account, you can also edit the scheduled post to add hashtags, tag users, add a post to your content queue and repeat the post. Note that there are limits to how many social accounts you can use with the free plan. I had to disable my Twitter account so I could use LinkedIn. What I like about DrumUp is that it’s good at surfacing content I might have missed. I also have a choice whether to read the content before scheduling or just adding it to my queue. With the free account, you can schedule 3 posts per day per social account. You can schedule more with one of the paid plans. A paid account also gives you access to RSS feed imports and the ability to create a content library. And DrumUp is also available for mobile devices, which lets you discover and schedule content on the go. 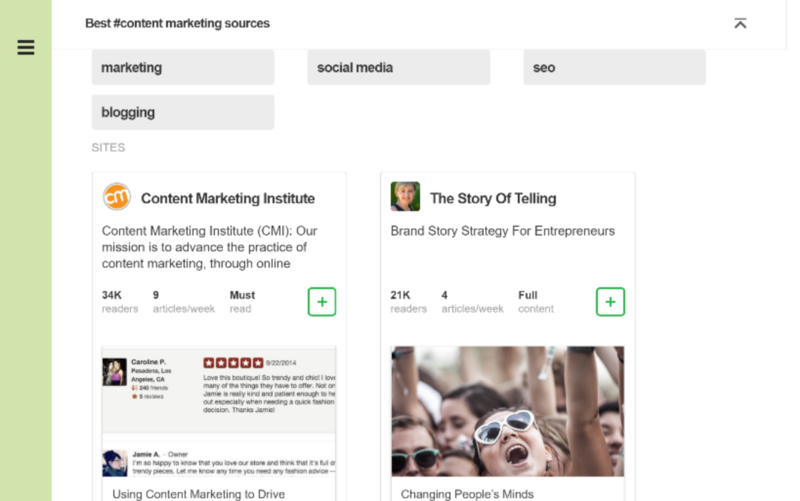 MissingLettr isn’t a content discovery tool, but it’s great for sharing your own content. I’m using the free account, which allows me to create Twitter campaigns for my own site, but with the paid plans you can add more sites and share to multiple social media accounts. First, create an account with either a username and password or by signing in with Twitter. Then press the “add a site” button to add the URL or RSS feed for your blog. Next, add a social account. I’m using Twitter here. This is where Missinglettr will send your social media campaign. That’s where I stopped with the setup, but there are other options you can tweak. Check out the scheduled time slots the site has created for sharing your content and change them manually if you’re not happy. You can also edit your brand name and brand image, otherwise Missinglettr will simply use your blog title and social media avatar. Finally, if there are any terms you don’t want mentioned, add them to the blacklist. The magic happens the next time you publish new content on your blog. The site detects the new content and pre-rolls a one year social media marketing campaign for that piece of content. You get an email to let you know it’s ready to review. Click on the button and it will take you directly to the campaign. There are three things you need to do next. First, review the hashtags being used for your social media campaign. Missinglettr assigns these automatically, but in my experience, there’s usually at least one that’s so general you can delete it. Second, look at the messages (scheduled at intervals over the coming year) and see if you’re happy with them. Missinglettr creates attractive quote images from your text, as well as pulling images from the post. You can edit the text of any social message before you approve it. That’s it. 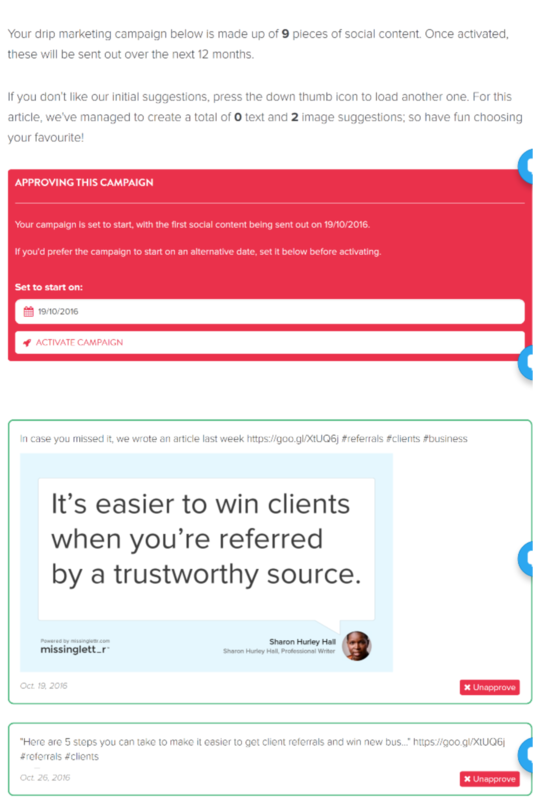 For me, this tool has helped to ensure that my own content gets promoted regularly and it only takes a few minutes to approve the automatically created campaigns. I now have a content queue stretching into the middle of next year. With a paid plan, you can also create campaigns for past content, which is a great way to keep getting attention for evergreen content, for example. While using Missinglettr will take more time with more social accounts, if you spend time up front tweaking, you may reach a stage where you’re making very few changes to campaigns. The difference between Quuu and some other tools is that the content you will eventually share is curated manually by the site’s editors. To get started, login with your Buffer account, then add your email address. Decide how many posts you want to schedule every day. The free account allows 2. Quuu automatically picks up the accounts you have added to Buffer. Select at least one to use with Quuu. In my case it picked up Facebook, LinkedIn, Twitter, Instagram, and Google+, though I actually have more social accounts in Buffer. Next, choose interest categories. 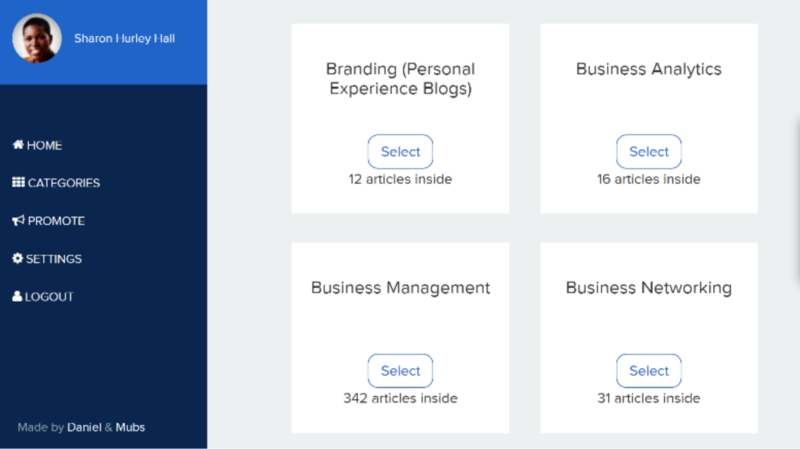 Each category shows you how many articles are available for sharing. 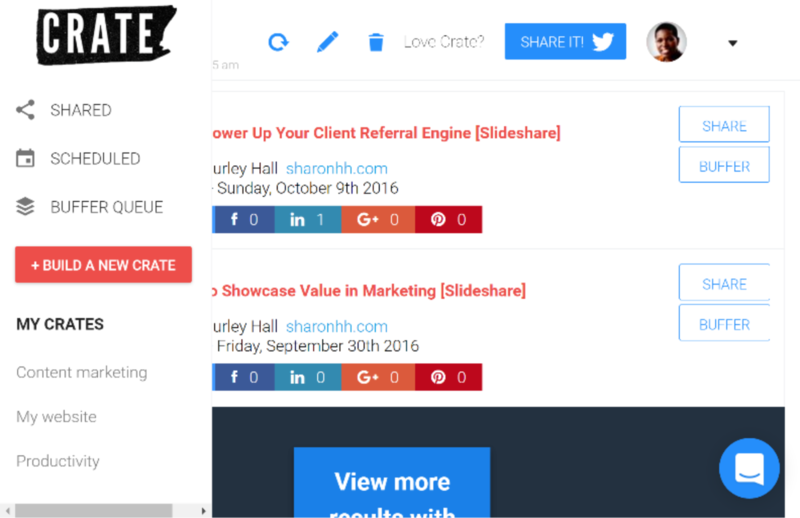 Quuu then sends articles to Buffer where they become part of your Buffer content queue. At the start, it’s a good idea to review the content, but if you’re generally happy with the content, you can take a step back and let it work automatically. 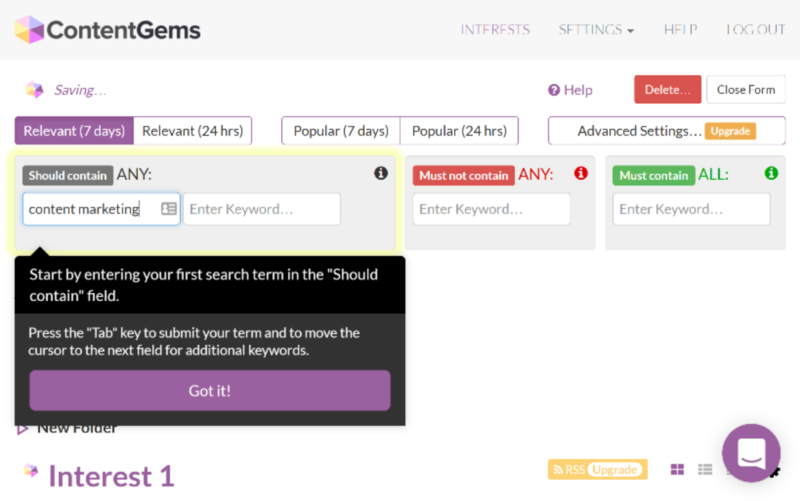 ContentGems is another tool for content discovery and sharing. Using the site’s huge database of sources combined with your own filters, you can create a personal stream of content that’s relevant to your business and audience. You can also share it via, not only social media, but also your email newsletter, websites, intranets, and other channels. Paid plans give users more suggestions and filtering options with the content stream updated in real time. I tested the free plan which lets you track a single interest. If you’re focused on only a few topics, consider the “individual pro” plan at $9 a month. Getting started is simple. Just input keyword terms into the boxes (you can have more than one and also exclude unwanted terms). If you don’t like what you see you can tweak the keywords to make it more relevant, though you’ll need a paid account to make major changes. With a free account, automation stops here. You’ll have to share content yourself using the on-screen buttons at the end of each article. However, if you have a paid account, you can turn this content into an RSS feed and add it to your Buffer content queue. 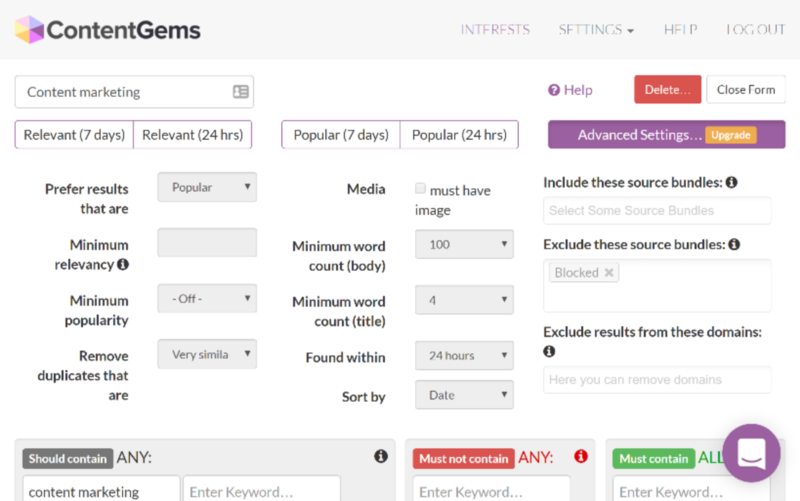 When I tested ContentGems, I was impressed by the quality of the content it curated and would have been happy to share all of it. If you’re using Feedly as a tool to keep up with the blogs you follow, as I am, you might overlook the fact that it’s a great content discovery tool as well. Let’s face it: Feedly is already tracking a gazillion sites so what better place to find new content? There are a couple of ways to find great new content in Feedly. 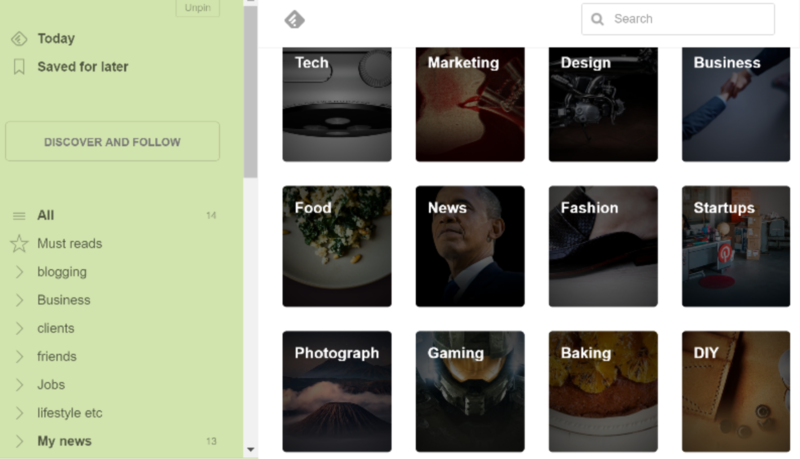 You can click on the “discover and follow” menu to find curated collections of sources on topics of interest. Those are also available as a drop down list when you click the search box. Or, you can use the search box to find the best sources on a specific topic. From there, you can follow a source, add it to your own list, or save an article or read it inline and share it via a number of on-screen tools. The sharing tools available vary depending on whether you have a free or paid subscription. 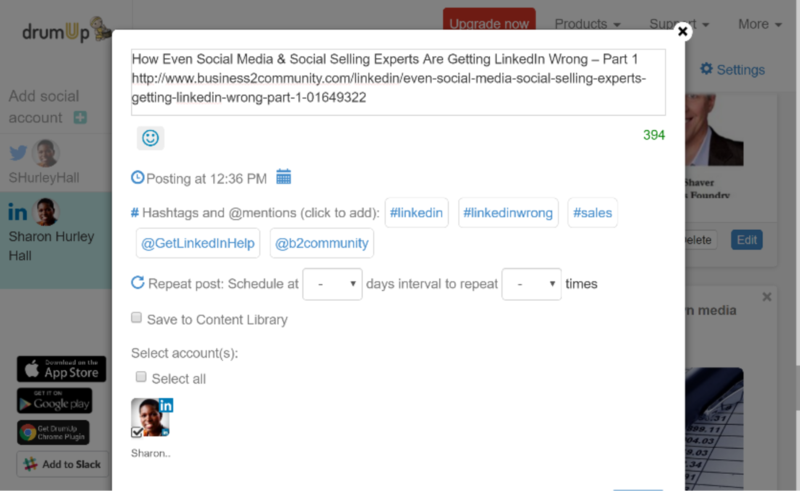 I was able to add content to Buffer, but not to Hootsuite. The big advantage of Feedly is that content discovery is super-fast. You don’t have to wait long to find content for your social sharing queue. Finding great content takes time, and great content is what it takes to win and keep your customers. 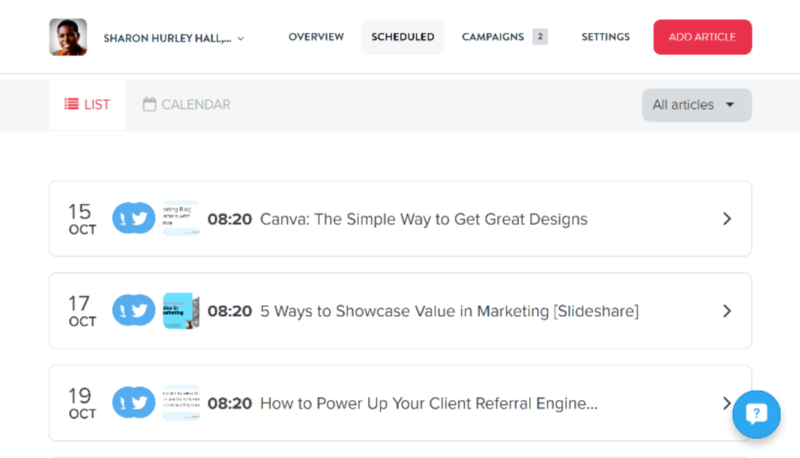 These tools can help you save time on this part of your content marketing workflow while giving you an engaging online presence that your customers will love. Combining tools also works. For example, I use MissingLettr for my own content while using the other services to share other people’s content to different social media sites. It won’t take long to find a combination that works for you. What’s your favorite content discovery tool? How do you save time while keeping up your activity and engagement in social media? Attract Your First 1,000 True Fans! Get the critical mass you need to have a sustainable and impactful online business. Sharon Hurley Hall is a professional writer and blogger who has previously worked as a journalist, editor and journalism professor. Her work has been published on CrazyEgg, Growth Lab, Mirasee, the Pex Card blog, Unbounce, Search Engine People, Search Engine Journal and elsewhere. 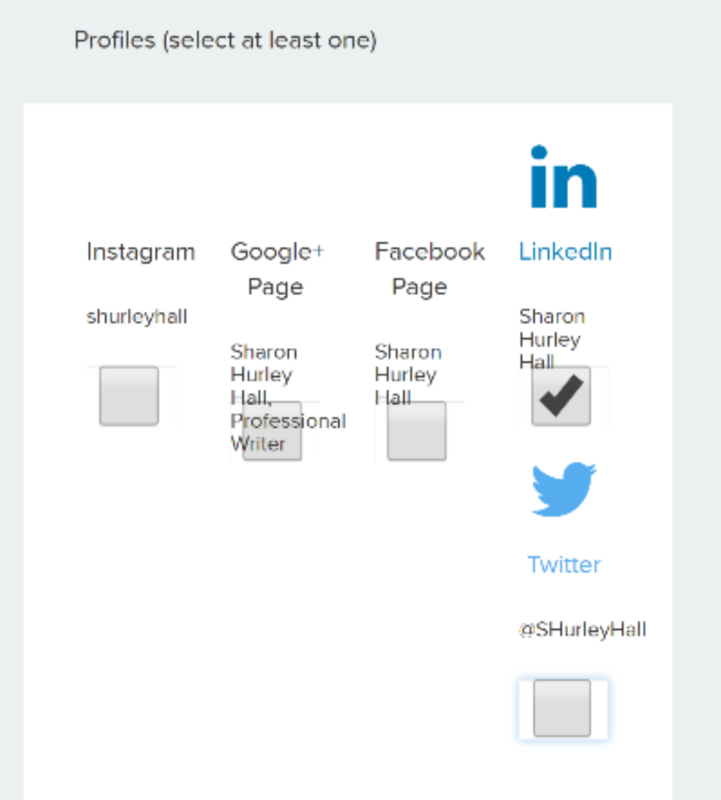 Connect with Sharon on her website or LinkedIn. Thanks for sharing this awesome piece of content. I myself use ContentGems and Quuu on my websites, both are awesome.. Thanks for adding your opinion, Mukesh. Quuu has certainly revolutionized my LinkedIn engagement, in particular. Great article! I had been looking for easy ways to find and share content. These are all great tools! This was exactly what I was looking for! Thank you! Happy to have helped, Karen. I’ve certainly found these tools useful, especially on the sites where I don’t have as much time to be active. Sharon – this is such a good, comprehensive description of these tools – I only knew of a couple of them. I’m forwarding to some friends. Thanks. Glad you like the article, and thanks for sharing, Virginia. I usually roll my eyes at these lists but this was really, really useful. With all of these resources I either didn’t know about them or haven’t used them in the way you’re suggesting. Thank you! So happy you like the tools, Joel. Hope they work well for you. Kind of you to say so, Charles. I wanted to share some different tools for a change, and I’m finding them pretty useful. I haven’t heard of any of these. I’m so strapped for time (which is part of the point of my blog – yeah, I know it’s insane) I know I’m sharing things that don’t make any sense for my brand, so thanks for this list! I’m excited to try them and stop wasting my time on social media. So glad you like the list, Beth. Hope you find a couple that really work well for you. Started with the first tool suggested – Crate. I have created an own filter with keywords related to data storage, protection, and backup. That’s really strange, Rado. I’ve found the Crate people pretty helpful; maybe they can troubleshoot it for you. Hey Rado – Thanks for giving GetCrate.co a shot, sorry to hear you’re having a hard time getting results! I’m one of the co-founders and would be happy to help you get set up and started without the pregnancy and heart arrhythmia noise! Feel free to drop me a line directly through the chat or send me a note (ross at get crate dot co) — It’s likely that one or two keywords populated into your Crate sent our bots astray. Sharon – what a fantastic post! I’ve left my social media platforms stagnant for too long because of the time it takes to find great content, share it, etc. Your resources is making me bubble with ideas! Thank you! You have shown amazing tools to make social sharing effortless. Most of them I’ve not given a trial but from now itself want to look their magic. Now-a-days, tools makes our work easier and effective. Eventually, thanks for exploring these beneficial tools. Thanks for the great summary of tools here. I’ve just started using feedly and buffer but because buffer isn’t paid it doesn’t integrate as I would like it to. I’d like to know what a typical day/week looks like in terms of working on your social media feed. Do you spend one day queuing all your content and set it for the week, or do you spend time every day making sure your feeds are full? I do a mix of manual and automated, Calvin. I spent a lot of time setting the tools up to find the right content. With Quuu, I’ve linked it to one social account for a single daily update. Anything else goes manually. Some of the others allow me to find content to add to Buffer, which I can, in theory, queue up weekly (though that doesn’t always work out). Thank you for sharing this great post Sharon! I found it very informative and I’m excited to test out each of these tools. I have been searching for Content tools. I’m happy to have found this post. Thanks again! You can build a profitable platform with a critical mass of 1,000 true fans. Join our community and get the blueprint for growing your fan base to 1,000 - and beyond! By submitting the form above you will be entered into my database. You won’t be signed up for anything. However you may receive an email from me or my company every now and then pertaining to my site and news. I promise to NEVER rent or sell your email address.